This may come over as a grumpy old man, but I think that it is valuable to air one's confusion in the hope that some understanding may follow. There are of course many serious things in life that confuse me, but I want to share some lighter things, as sometimes, if I get too serious, I start to confuse myself. 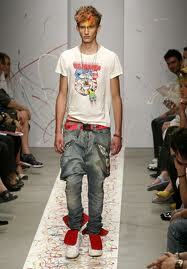 The current fashion among many young men for a certain trouser style confuses me. You know the sort. They're half way down the arse, looking as if some very serious accident has happened with the persons bowl movements. Now, to me, the fact that they look ridiculous is a given, but what confuses me is not why, but how. This is a science question. How do they stay up? Is there some secret stud attached to the underpants, or double sided Velcro fastening to stop them from falling down? Obviously it's not the done thing to stare at a young man's arse, or you get a reputation, or worse, a Glasgow handshake. I'm confused, what is behind (pun intended on the word behind) the science of this fashion? In the week before Christmas, I saw a group of young women walking along the street (that's another view from an upstairs window) obviously going out for the evening. It was one of the coldest nights of the year, and each of them was wearing the minimum amount of clothing. Now that confused me, as I swear I could see goose bumps from 100 yards away. A day or two later there was a piece, with photographs in a national paper asking the very same question that was in my mind. Why? The answer given by the girls was that they felt that this was the only way to "pull a bloke". I couldn't decide who was more shallow, the women or the men. Probably both were in equal depth. Has it always been like this? No doubt it has, but wearing next to nothing on the coldest of nights still confused me. Now let me be honest, I'm out of my depth (pun intended on the link with shallow - do you see what I did there?) here. I've never been on the pull in my entire life, and that's 63 years now. A "friend" years ago postulated that I had been born old, and therefore skipped the growing up phase. A wee bit harsh I think. I do remember, or at least I think I do, (it could have been a wishful dream), a woman coming on to me a few years ago. I think she was drunk. My response was to turn into Mr Bean - though married twice, I've never really been any good with women. So, I get confused and I am confused. The human behaviour question is this, "What is the link between 'pulling' and clothing?" Only serious answers will do justice to the content of this blog. Finally (thank god for that I hear my readers say), what is it about the use of mobile phones on public transport? What confuses me is why so many people can be unaware of their intrusion into my personal space. The mobile phone is not the problem, but the use of it is. It's a little bit like money. The bible doesn't say that money is the root of all evil, but that the love of money is. It's the same with a mobile phone. When you're on public transport, you're stuck there; there are only so many seats to move to, and as sure as eggs are eggs, if you move seats, some other bugger will start a phone conversation. I'll be honest, this particular issue goes beyond confusion - I suffer near apoplexy, but in the true British spirit of not wanting to make a fuss, I do nothing, but seethe. I may mind a little less if there was a conversation worth listening to, but it is mostly inane drivel. I'm confused. Why be so full of yourself that you care nothing about the feelings or personal space of those around you? I wish I had the courage to take the phone and make it truly mobile (the pun's keep coming don't they?). I'm sure that half-arsed trousers will continue to be worn; skimpy dresses will still be used to pull, and mobile phones will continue to be used for the annoyance of others. I don't feel in the least bit educated after all of this, but in a strange sort of way this has been quite cathartic. Now that's confusing.